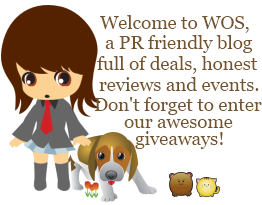 As I was enjoying the outdoors the other day and chatting with one of my blogger friends, we were discussing how much we love Monroe and Main because they have such a wide assortment of items for women of all shapes and sizes (6-24 or S-3X). She was telling me how she is usually hesitant to order online and sometimes I am too because things may not fit or look right. However, things always work out with Monroe and Main. Partly I believe it's their stellar customer service that I've personally experienced. The other component has to do with taking your measurements correctly and knowing how to dress your body type. 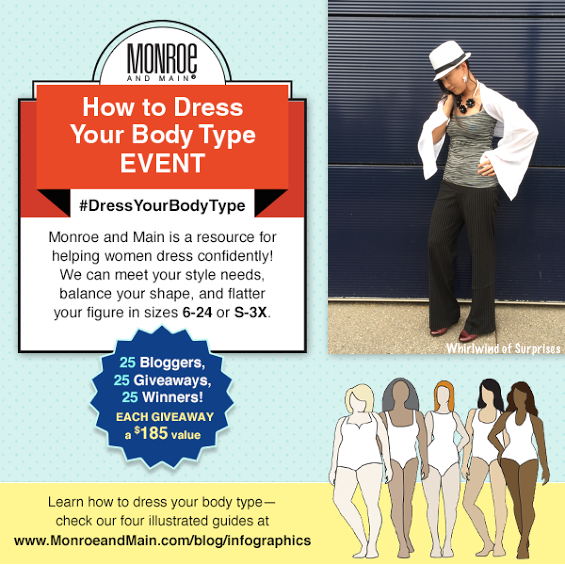 Monroe and Main has a fabulous "How to Dress Your Body Type" Infographic Series that you can take a look at, however I will go over the basics with you as well. 1) Measurements -Start here. You need to know several key measurements including your bust, waist, and hip measurements. 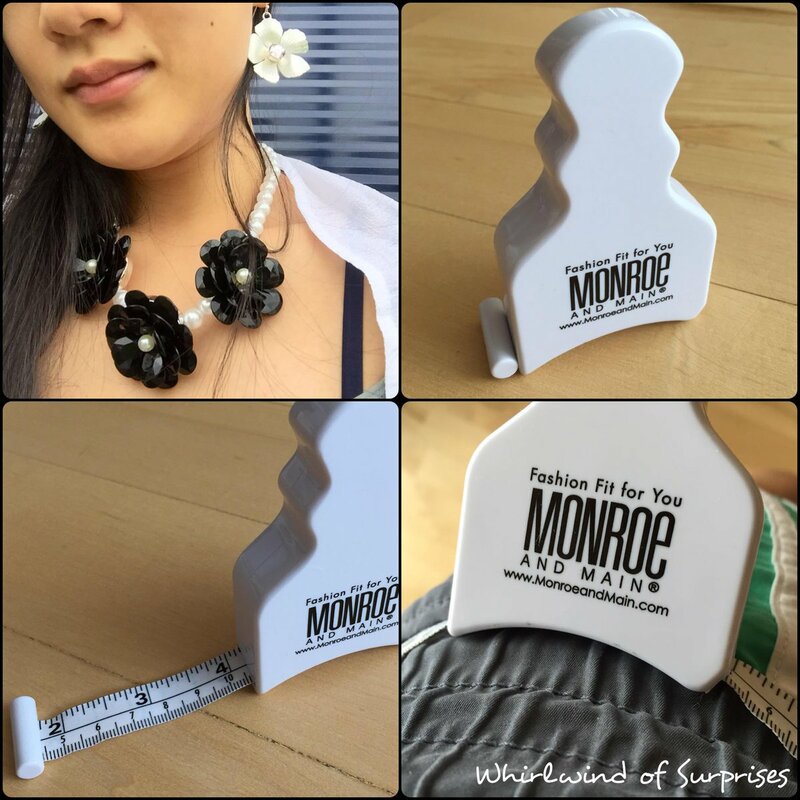 Monroe and Main have this adorable measuring tape that you'll see below that makes measuring more convenient than ever. The retractable tape measure stays in place for measurements and for added ease, has an area to loop in the end of the tape. The important thing to notice with the tape is that it doesn't start at 0 but rather starts at 4.4cm or 1.75". When looped in, the measurements really start at 2". Simply put, the 2" accounts for the solid part of the measuring tape so that you don't have to add or subtract anything. Measure away! 2) Identify your Body Type -With your measurements, you can now figure out your body type. Depending on how your measurements compare, you may be an hourglass, rectangle, inverted triangle, triangle or oval. I was an hourglass shape by my measurements. 3) Shapewear -These come in all sorts of shapes and sizes. You have to consider what you're trying to enhance, your comfort, as well as your overall outfit. I personally love the shape wear I picked up from Monroe and Main. In my outfit below, I have a full braless body suit on, which helps to control the pooch and thighs while allowing me to wear the bra of my choice. It does wonders to smooth things out and I love it. My only issue with full body suits is that it makes going to the ladies room slightly more difficult. 4) Prints and Colors -I honestly loved that Monroe and Main had recommendations for the different body types. You want to have a great outfit without going crazy. I decided to try to mix prints and as I learned, the key to mixing prints was to keep them within the same color family. 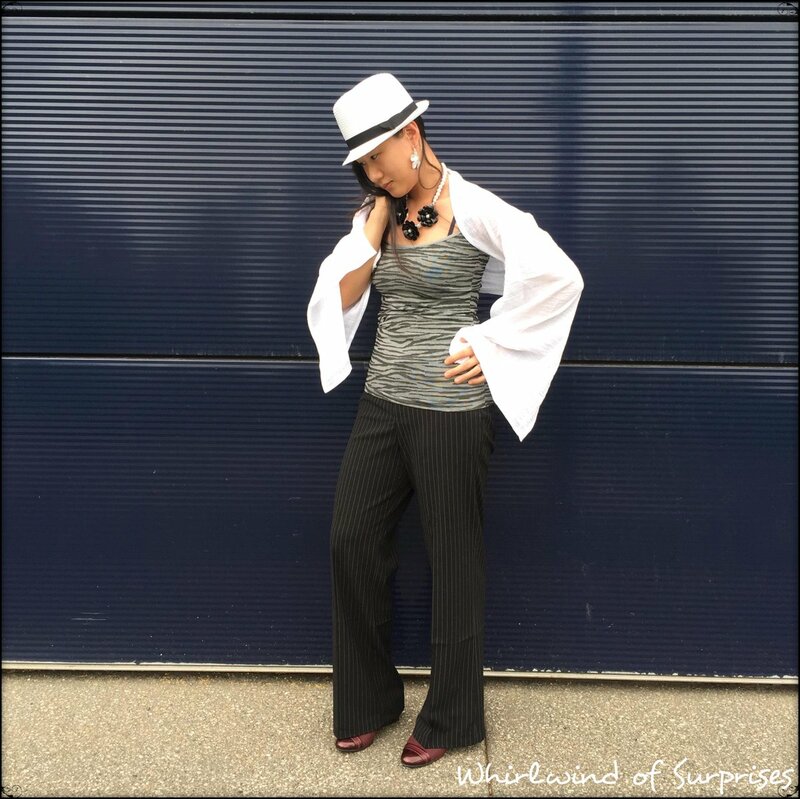 In my outfit, I chose to go with varying shades of silver, grey, black, and whites. I will admit, I decided to go for a pop of color in my shoes, however I purposely chose a darker shade of red as to not go overboard. Everything in my outfit from head to toe was from Monroe and Main except my bolero. 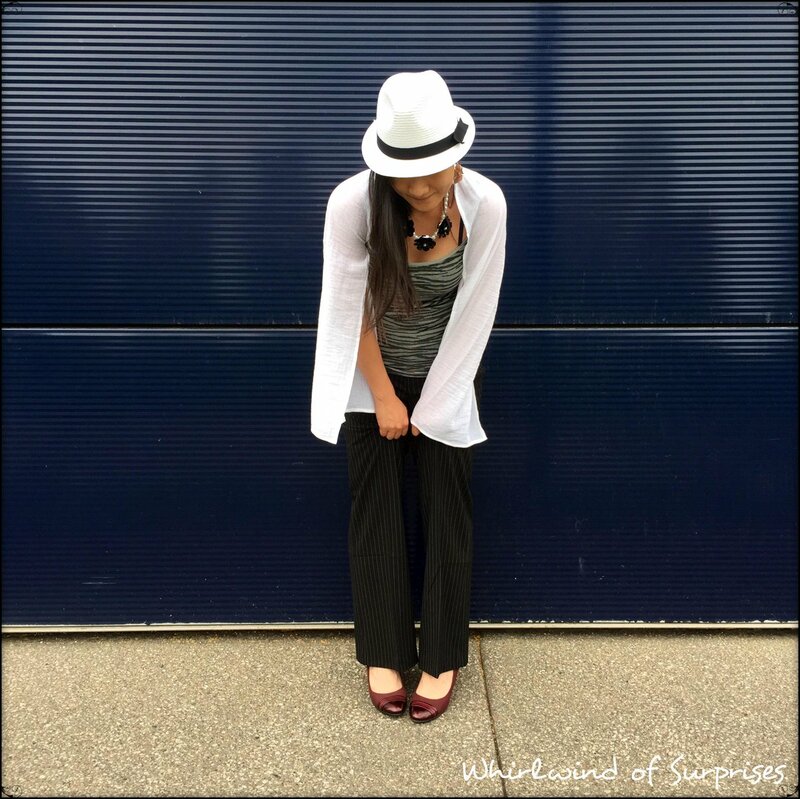 It was so difficult to make a choice as they always have a great selection but these were the pieces that I fell in love with when I was assembling an outfit in my head. 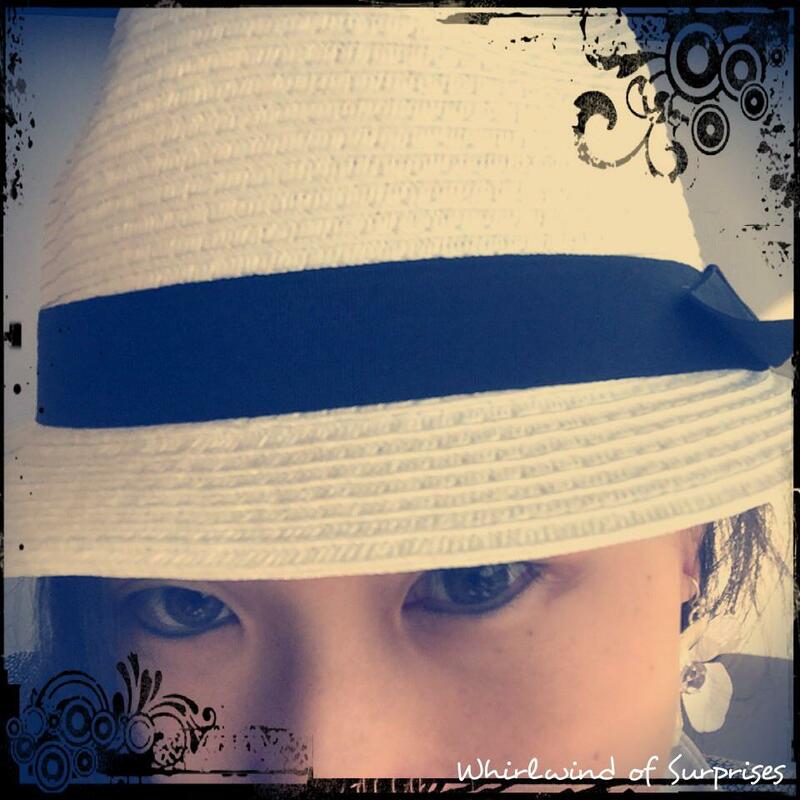 The Fedora is my go to hat and it's finally a hat my husband loves as well. The earrings and necklace are such versatile pieces to pair with casual or dressy outfits. The Wild Side Control Tank in Zebra is easily one of my favourite tanks currently. Silky smooth and soft on my skin, the tank is not only sharp but also easily accents any outfit. The Audrey trousers are wide legged and so comfortable to walk in. The Juliana Wedges are soft and comfy to walk in, even when I'm walking around all day at work. Overall, I'm in love with this outfit. The vibe is so chic and comfortable and I feel like I just walked out of a magazine shoot. What do you think? I love these contacts from Lens Circle! They make my eyes look bigger and work for my prescription. It's a fun and easyway to spiff up any look. Monroe and Main has been generous enough to offer 1 Whirlwind of Surprises' reader a Monroe and main Shapewear Prize Bundle (shape wear and an outfit) worth $185. Enter on the Gleam Form below from May 18 12:01AM EST to May 31 11:59PM EST. Open to US, 18+. Good luck! Once you finish here, visit our friends below for 24 additional chances to win! Check back daily for new entry methods! 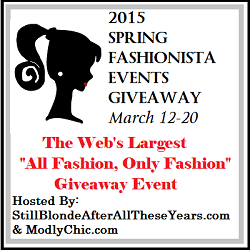 Don't forget that you have 25 total chances to win through our fellow fashionista's sites. 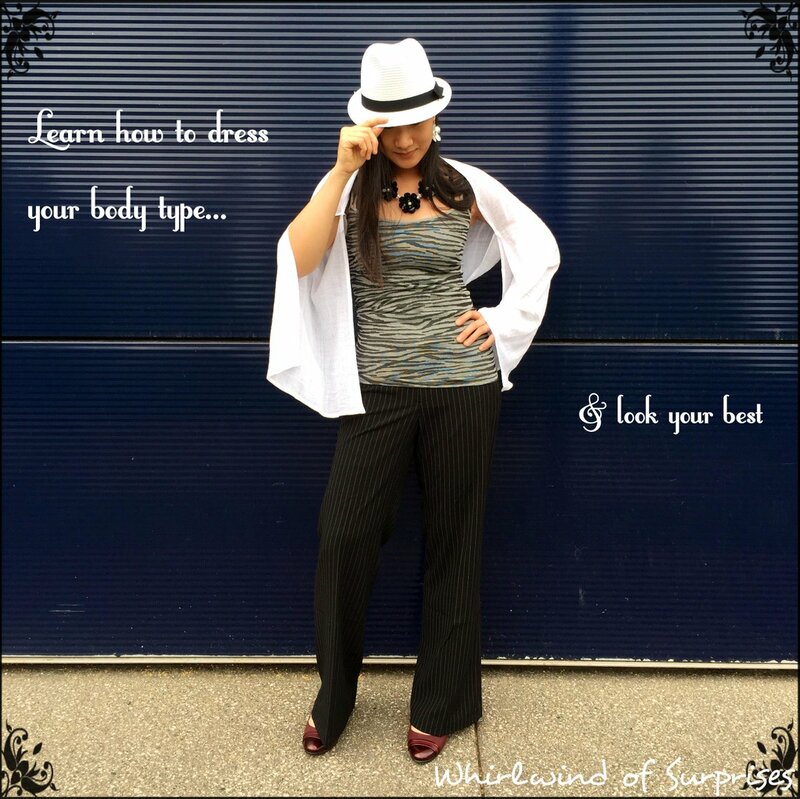 Check out what shape wear and outfit they chose to complement their body types.